Eduardo Montealegre is Colombia’s former chief prosecutor who successfully tried top government officials but whose reputation is marred by one of the country’s biggest ever embezzlement scandals. Montealegre was born in the town of Ibague, Tolima in 1957. The top prosecutor graduated in Criminal Justice at Bogota‘s renowned Externado University and Constitutional Law at the Erlangen University in the German city of Bonn. The law professional first took a public job in 1987 when he became a member of the government commission of jurists to formulate Colombia’s Criminal Proceedings Code, did several freelance jobs for the Justice Ministry and, according to political news website La Silla Vacia, was an occasional judge. Being the prodigy of former Inspector General Jaime Bernal allowed Montealegre to obtain top positions. In 1997, Inspector Bernal appointed him Vice-Inspector General. Then-President Ernesto Samper (Liberal Party), at the time accused of using drug money for his 1994 election campaign, considered Montealegre to become justice minister, but eventually chose Almabeatriz Rengifo. Instead of becoming minister, Montealegre kept his position as Vice-Inspector General until the end Bernal’s term in 2001. Controversially, as Vice-Inspector General, Montealegre was an explicit supporter of legalized anti-guerrilla groups called Convivir that were in the process of joining the illegal paramilitary groups of the AUC. He was also a strong critic of peace talks with leftist FARC rebels when they started in 1999. By the time these talks failed, Montealegre had been appointed a member of the Constitutional Court, partly due to effective lobbying by the Liberal Party in Congress. However, that Liberal Party faced a growing crisis over Samper’s alleged ties to the Cali Cartel and its support for the failed peace talks. One of the party’s defectors was former senator and governor Alvaro Uribe, who found a political opponent in Montealegre after his election as president in 2002. 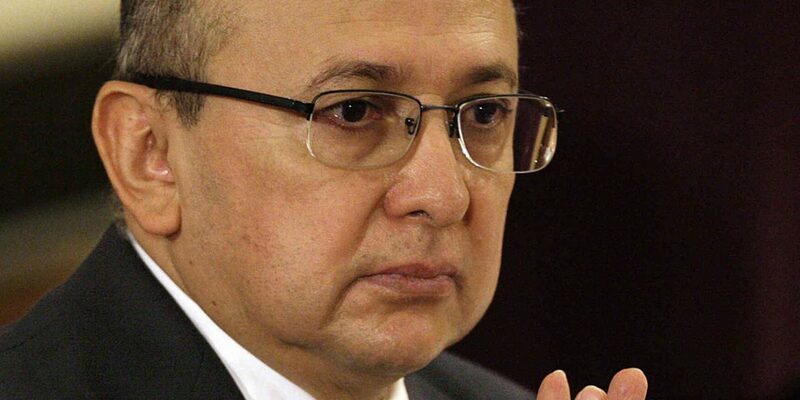 As a member of the Constitutional Court, Montealegre sank Uribe’s Counter Terrorism Statute that reformed the constitution to give judicial police functions to the military. While in the middle of his term as Constitutional Court magistrate, Montealegre surprisingly resigned in 2004. According to La Silla Vacia his resignation was rumored to be due to his ambition to become Prosecutor General or because he was offered lucrative businesses as an attorney. Regardless, Montealegre did not become the country’s top prosecutor just then. Instead he became, among other things, the judicial adviser of his personal friend Carlos Palacino, who at the time was the chairman of health intermediary SaludCoop. Between 2004 and 2011, and with Montealegre as judicial adviser, SaludCoop embarked on a massive embezzlement campaign that ended in 2011 when the company’s exorbitant expenses and investment schemes nearly caused it to default. By that time, the company had embezzled approximately $500 million and its board of directors, including Palacino, was facing criminal charges. Instead of falling from grace, Montealegre was hired as an adviser to President Juan Manuel Santos (U Party) until Congress elected him Prosecutor General in 2012 to replace Viviane Morales, whose 2010 election had been deemed illegal. By the time Montealegre took office, major tensions had grown between Santos and his predecessor Uribe. Uribe was supposed to propose the candidates for the Prosecutor General position in 2009, but the Supreme Court refused to elect any of the former president’s choices. When Santos took over the presidency in 2010, he immediately instituted his own candidates, one of which was Viviane Morales. The Supreme Court appointed the Uribe-critic Morales as Prosecutor General, the first woman to obtain the position, in spite of lacking the necessary number of votes. Morales then intensified ongoing criminal proceedings against former members of the Uribe administration, which Uribe had hoped to prevent by having a political ally elected as Prosecutor General. Uribe had been facing major legal issues for years over his ministers bribing Congress to approve a constitutional reform that would allow his 2006 reelection, and ongoing revelations over ties between paramilitary groups and members of Uribe’s congressional coalition, security detail and even his family members. Montealegre continued these investigations and secured the incarceration of three former ministers, one intelligence chief and numerous former lawmakers. However, the judicial onslaught increasingly widened the gap between Santos and Uribe. Uribe began accusing Montealegre of leading a political persecution against him and his political allies and family members. The former president’s accusations seemed confirmed when Montealegre filed criminal charges against the country’s Comptroller General, Sandra Morelli, who had investigated the financial chaos of SaludCoop and had accused Montealegre of being complicit in the health intermediary fraud. Morelli fled the country, claiming Montealegre was trying to take revenge over her report on SaludCoop and that she would be unable to receive a fair trial over alleged mismanagement of Comptroller General property. While going against major forces like Uribe and Morelli, Montealegre increasingly became an ally of Santos, who also had lost the support of Uribe because of the 2010 prosecutor general election and peace talks with FARC rebels that began in Cuba in November 2012. Montealegre became one of the main supporters and promoters of the peace talks with the FARC, suspending rebel leaders’ arrest warrants and allowing them to travel to and from Cuba. Meanwhile, Montealegre increased pressure on Uribe, his family and his political allies. Numerous allegedly corrupt allies of Uribe fled the country, fearing they would not stand a chance in court with Montealegre at the head of the Prosecutor General’s Office. Vague accusations made by Uribe in 2014 that Santos had received drug money to compensate losses from the 2010 election campaign were quickly dismissed while investigations against Santiago Uribe, the former President’s brother, were formalized. Instead, the Prosecutor General’s Office went after Oscar Ivan Zuluaga, Santos’ opponent in the 2014 elections and one of Uribe’s most loyal political allies. Zuluaga’s campaign team had illegally been spying on the peace talks, hoping to discredit them in order to win the elections and remove Santos from office. The attempts failed and Santos won the elections. However, it wasn’t until October 2015, two weeks before local elections, when Montealegre took up Uribe personally and asked the Supreme Court to open a criminal investigation into the former president’s alleged complicity in a 1997 paramilitary massacre, accusations that had been Uribe’s sword of Damocles for years. He left his post as Prosecutor General on March 28, 2016 when the Supreme Court appointed Nestor Humberto Martinez, another corporate lawyer, as his successor.